American winery Banfi has followed drinks giants Diageo and Campari and ended its sponsorship of Thailand’s largest elephant polo tournament. The vintner said its executives were “horrified” by video footage of handlers repeatedly beating elephants into submission before the tournament, which was uploaded by People for the Ethical Treatment of Animals (PETA) last month. Banfi, along with Diageo’s blended Scotch whisky brand Johnnie Walker and Campari Group, faced a severe backlash on social media for sponsoring the Anantara Riverside Bangkok Resort’s 2018 King’s Cup Elephant Polo Tournament. The animal rights campaign group put Banfi, Campari and Diageo in the spotlight in March by uploading a video to youtube which showed behind-the-scenes footage of handlers beating the elephants at a polo match. In the video seen by the drinks business handlers repeatedly struck and gouged with bullhooks—sharp steel-tipped rods which look similar to fireplace pokers— as well as violently pulling at the animals’ ears. Banfi Vintners was founded in New York in 1919 by John F. Mariani, Sr, and has since grown to become one of America’s leading importers of fine wines. But its sponsorship of the 2018 tournament drew criticism on Banfi’s Facebook page. “Please do not sponsor animal abuse, that definitely is NOT art,” read one comment on a post dating back to March. “It’s cruel to force animals to perform meaningless tricks for human entertainment,” said another. The vintner was “quick to reject the cruelty of beating elephants into submission for an archaic polo display,” PETA’s executive vice president Tracy Reiman said. Banfi has been approached for comment. Anantara is part of Minor International, a Thai conglomerate that owns several hotel, restaurant and retail chains. 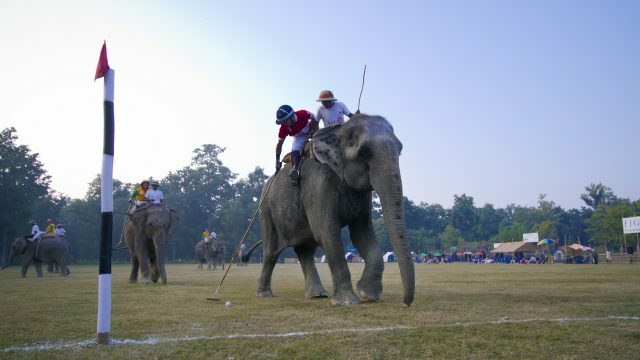 King’s Cup Elephant Polo is a championship Elephant polo event played three times a year – in Thailand, Sri Lanka, and Nepal. In each match, two teams compete – each team consisting of five humans and five elephants. PwC, Angus Energy, Ecolab, Leading Quality Assurance and Piaggio Group have all ended their partnerships with the tournament since the video was uploaded.